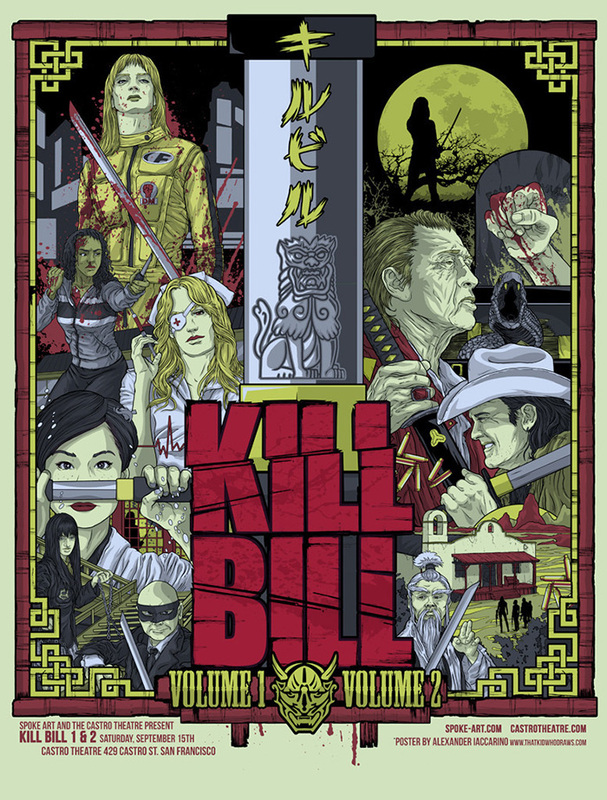 This gorgeous poster was produced for a special screening of Kill Bill at the Castro Theatre in San Francisco for Spoke Art, in September 2012. Iaccarino’s work is of exceptional quality and this print made people stand up and take notice. It was released for sale as a giclee edition for $50 with 100 produced, all hand numbered. It was 18”x24”. Kill Bill is an American action/thriller film written and directed by Quentin Tarantino. Kill Bill was originally scheduled for a single theatrical release, but with a running time of over four hours, it was separated into two movies: Kill Bill Volume 1, released in late 2003, and Kill Bill Volume 2, released in early 2004. The story follows "The Bride", a former member of an assassination team who seeks revenge on her ex-colleagues who massacred members of her wedding party and tried to kill her.